There are a total of 12 spawns spread all over the Lost Lands in Felucca. The 5 Felucca Dungeon monster groups rotate randomly between all these locations, except for ‘Oaks’, which is always Forest Lord. Names given are those by which they are known to most players, and by which they are referred to in conversations. Click on those names below to view more information on each location. 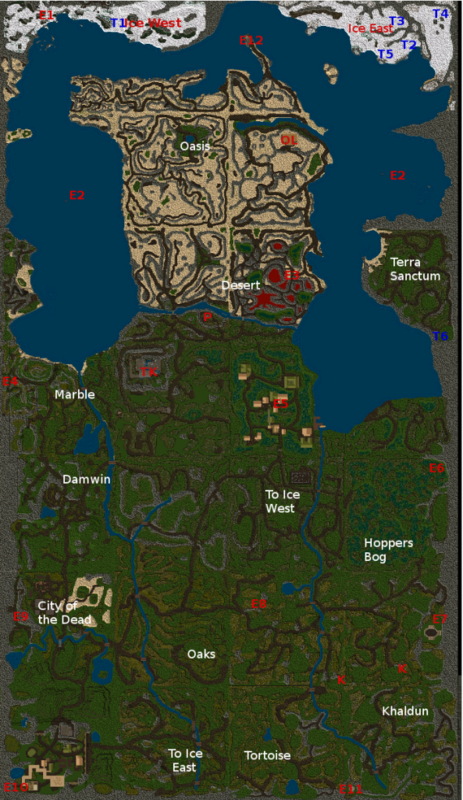 Also marked on the map are teleporters found in the Ice East and Ice West areas (T1 – T5), exits from Lost Lands (E1 – E12). More information on these features can be found below the map. The entrances to Dungeon Khaldun (K), Paroxymus Lair (P), Terathan Keep (TK) and Ophidian Lair (OL) have also been marked. T2 62.18N x 6.32W This teleporter will take you to a location just northwest to 67.51N 13.17W. E1 69.20N x 66.01W The exit from Ice Dungeon. E2 31.17N x 61.31W – 36.17N x 11.57W Serpent Pillar (Say sueacron to teleport to Britannia). E3 17.55N x 27.25W The exit from Fire Dungeon. E4 2.43S x 71.47W The entrance to the passage to the marble building. E5 6.56S x 29.02W The Papua mage shop teleporter (Say recsu to teleport to Moonglow). E7 49.18S x 4.25W The exit from the Minoc north mines. E8 47.59S x 31.38W The exit from the passage from Vesper Cemetery. E9 48.46S x 70.52W The northern exit from the Trinsic passage. E11 84.06S x 16.39W The teleporter to Temple Island. This altar is located in the icy region reachable by either going through the Ice Dungeon (E1) or using the teleporter sparkle near the ruins of the old Minax Stronghold, marked ‘To Ice West’ on the map. Located in the eastern icy region, this altar is only reachable by boat or by using teleporter sparkle east of Delucia, marked ‘To Ice East’ on the map. The spawn is divided by a mountain range that can only be crossed by using a boat or the system of teleporters T2 – T4. This altar is found on the road just south of the oasis pool. Access is either through Yew Prison, Fire Dungeon or Moonglow Encyclopedia Magika. To access from the prison open the secret door, step on the stone altar and emerge at the eastern end of the tunnel in the Lighthouse, E12 on the map. This altar is located straight west of the entrance to Fire Dungeon, E3 on the map. Access is either through the dungeon or, more frequently, North from Papua Mage shop, E5 on the map. Reached by saying ‘recdu’ while standing on the pentagram in Moonglow’s Encyclopedia Magika. This altar is located in a remote bay, which is ONLY reachable by boat, however a teleporter at the far south of the area allows an alternative exit, T6 on the map. Click on this link link for a guide through the sewer. This altar is just southwest of the exit from the Britain Sewers, E6 on the map. While the sewer is the nearest entrance/exit the most frequently used route is through Minoc North Mines, E7 on the map. Click on this link to follow the path This altar is located right between the City of the Dead and the now abandoned Orc Fort. The nearest entrance/exit is the northern branch of the Delucia Tunnel, E9 on the map. However the more usual route is to use the Southern branch, E10, and travel north from Delucia. This altar is located just southwest of the passage to the Vesper Cemetery, E8 on the map. The spawn here is always the Forest Lord monster group when it is active. Karma is lost when fighting here. This altar can be found just north of the small lake known as Tortoise Lagoon, from which it takes its name. To reach it go East from Delucia staying close to the southern edge of the map until the river crossing.